Yuinohama Project:PROJECT 2 DONATE:WA WA PROJECT-Social Creative Platform for Opportunity-Know and support projects in eastern Japan ! The tsunami which struck the district of Momoura in Ishinomaki washed away most of the local area, leaving Ogihama Elementary School to became an evacuation centre. Momoura residents were scattered, and with no temporary housing being built in the area, there is no place to live or gather, despite a desire to return. “If this condition continues too long then there will be no one left”. With harbour leader Tateo Goto, and head of the PTA of Ogihama Elementary School Yasumasa Kouya at its center, the “Yuinohama Project”, where a strong sense of danger and longing for their home resonates among its members, is working towards Momoura’s future by building a gathering space right in front of the shore. The Momoura district is located on the Oshika Peninsula of Ishinomaki and is known world wide for its cultivation of oysters. However the tsunami only left the school and 3 houses standing, swallowing the entire neighbourhood. Shortly after the disaster, the building of temporary homes began throughout the various affected areas, but this was not the case in Momoura. In a situation where, no matter how much love they had for the place they had grown up, there was no choice but to leave in order to start a new life, many local residents moved away from the district with painful reluctance. However, in the fishing harbour work to remove debris, collect and prepare fishing tools advanced, working towards the restart of oyster cultivation in early September 2011. But sadly, at the end of September typhoon #15 hit the area and caused a huge landslide from the mountains, once again washing away all the equipment which had been prepared. They were forced to postpone the restart of cultivation and while continuing to face such difficult conditions Tateo Goto, head of the local fishing association and oyster cultivator, clung to a particular thought. "When we were clearing the shore and preparing to restart oyster cultivation, there was no place with a roof for us to rest and shelter. Furthermore, no temporary housing had been built in the area so most of the residents had moved away. Even if they have a wish to return to Momoura, if they continue everyday life in the city areas they will be unlikely to return. However I want to keep the shore alive somehow. I want to create a place where young people may live and most of all I want to protect my hometown." 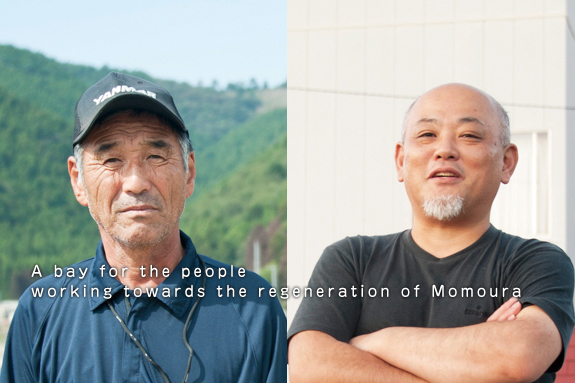 Yasumasa Kouya, who runs the guest house in the upper plains of Momoura and is head of the PTA of Ogihama Elementary School, also shared the same concerns as Goto towards the future of the bay. "Even before the disaster there were only 21 children at Ogihama Elementary School. And afterwards when so many people moved away from the area, there were only 9 children left by the beginning of the second semester. The head teacher and all teaching staff at the school take great consideration of the children and work towards creating a school with as much strength as a large school. I believe in the teachers and send my children there but obviously 9 children is rather few. To be honest I am worried how things will turn out from here." "Through the creation of this gathering space, and the involvement of those flowing through Momoura, we are also given energy. I want people to be able to gather here and then take the next step to creating residential areas." 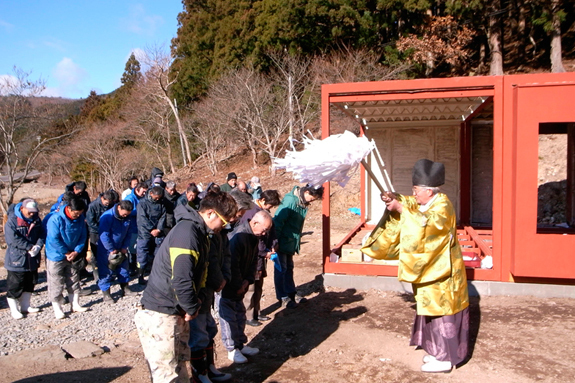 In January 2012 on a plain near Ogihama Elementary school, the members of Yuinohama Project, with tools in hand, were at work building the new community space. Little by little, fishing equipment is also being gathered for oyster cultivation. However, desolation still spreads out in the surrounding landscape. Goto, who has watched this scene constantly since the disaster, tries to express feelings which can not be put into words. "So much has been lost, I don't know what to say.....If we can restart oyster cultivation then this will bring people back to the area to a certain extent, so we are trying to prepare for this now. However, we have to face the difficulty of financial resources. Also with regard to the move towards higher ground, many of the residents are of the same generation as us so I don't know if they can wait 3-5 years. But despite this, I have the wish to protect my hometown. At the moment nobody has yet returned, but once this place has been built we can all come together, make events with the children and consider the future." Ogihama Elementary School is now entering its third term but the number of children still remains at 9. Amongst them, two are in the last grade so as of Spring 2012 there will only be 7 remaining. Kouya's two children are in the fourth grade. When they graduate in 2014 there may be only one child left, or perhaps none. Because of this situation Kouya eagerly awaits the time when residents will return to the area. "It has been nearly 1 year since the disaster, but there has been no significant change. The coastal wall is still left as it was from that day, and still there are barely any people living here after so many have moved to temporary housing elsewhere. But the building of the gathering space has progressed, so I think this is a starting point towards the regeneration of the area. The children are all full of life, but still there are some grades at the school with only 1 pupil. This of course raises worries about the making of new friends, relations between seniors and juniors, and their being able to work together as a group. Therefore some parents are considering to transfer their children to other schools, and there is even talk of closing the school." But Goto and Kouya continue to wait for the return of the local people. Even though the landscape of the neighbourhood has transformed, for them and the children who were born there, the sense of importance they feel for their hometown of Momoura does not change. Kouya talks of Momoura with the following words. "Before us we have the wide sea and to our backs we have the mountains and marshland. As for myself I feel a need to live amongst nature, and for the children it provides a never ending source of materials for play. Up until now the seawall has been built high and had met the forces of nature. But in this case we have come to realize that the disaster surpassed human strength. The seawall was built after the tsunami raised by the great Chile earthquake, but now it has been mostly destroyed. We could of course rebuild what was has been broken, but maybe if we consider the future it is better to rethink our way of life and the condition of our neighbourhoods, and move forward together with nature." The community space being built near Ogihama Elementary School with the support of "Yuinohama Project". A ceremony to celebrate the initial completion of the framework was held on 17th December 2011. ©2011-2012 WA WA PROJECT all rights reserved.